At last, we bring you the English translation of the Thierry Puyfoulhoux interview that I promised back in July. Puyfoulhoux is one of those extremely talented and original type designers who don’t get a lot of attention. Perhaps one reason is that he’s sequestered in the French Alps and doesn’t take his work too seriously, as you’ll see in the following conversation with Planète Typographie’s Jean-Christophe Loubet del Bayle. Special thanks to Frank Adebiaye and Sebastien Biot for the translation assistance. We can find many independant digital founderies on the web, some with very specific objectives. What is your commercial/aesthetic/personal goal with Présence Typo? Also, the name of the designers is rarely given next to fonts in catalogs which tells you somethings about how highly they are regarded. In publishing, citing the name of types should be mandatory. The publication “Photorevue” tried something new in the ’80s: every portfolio had a different titling font and the name of the typeface was mentioned at the bottom of the page. What did your first typeface look like? Like a first sexual experience. Can’t we talk about something else? Sure! What is your favorite creation? Classica was fun to draw, but Présence should do well because its lines are very clean. Sans-serifs can be just as expressive as serifs, and with less artifice, but their design demands greater maturity to avoid repeating what’s been done already. How does one become a type designer? You’re not good enough to be an illustrator. You’re lazy enough to only do what you like. You can scan old foundry catalogs. So you can become a type designer! There are some really good self-taught type designers out there like Jean-Jacques Tadjian (Radiateur Fonts) and Christophe Badani. But the easiest way is to go to art school. There are now quite a few good schools with good teachers, most of whom have gone through the Scriptorium in Toulouse. What did you do in the Imprimerie Nationale? I had an internship there where i had to work on a design by José Mendoza [photo] for administrative documents. I did the roman uppercase and all the italic bold letters, all of it on scratchboard — the traditional way. The master stopped by twice a week to see how much damage had been done. It must have been gut wrenching for him to see beginners disfigure his baby. I did some identity work. Logos and design guidelines. After 14 months, I realized that I was not made for team work. that something you set out to do? No. Some have a gift for freestyling, others for marathons. Though it is the correct word, I try not to refer to it as “labor” which is too closely connected to toiling and suffering. But that’s in fact the right phrase: lines of text like furrows, the plowman’s noble gesture, little birds and all that. What is the origin of your typeface names? Classica: “Renaissance” was already used. Tuxedo: That’s the American word for what we call a smoking [jacket]. It sounds stiff and elegant. The kind of font you’d need for a formal party at an embassy. Some of your typefaces are distributed by Creative Alliance and you decided to build your own digital foundry. What would be the typical steps a young type designer would follow to sell his fonts? There are two ways. 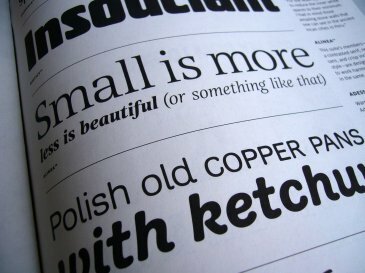 To let a large network like Agfa [now Fonts.com] or FontShop distribute your work. You then get access to a large audience which is a great boost for someone just beginning. The problem is that your work is just one amongst thousands. Regrettably, 99% of what these distributors sell is identical to what their competition also sells with only a few differences on promotional items. It’s supermarket-style management. Fonts are sold like lettuce. The other solution is to start you own foundry. “Less is more.” You sell a lot less but you know your clients and you get a better margin on the sale price. And it does not prevent you from selling your fonts as well as through big resellers. Marry Carole Bouquet [A famous and very beautiful French actress, who played in James Bond’s For Your Eyes Only (1981) — FA] and beat Mike Tyson at marbles. Seriously, I’m working on two revivals. One is a nineteenth century American typeface. For once it’s not the Yankees releasing yet another version of Garamond but a Frenchie who went looking around their attic. The other is a unique design from a great twentieth century page layout theorist [released as Tschichold]. I’m still adding to Classica with swash glyphs and ligatures for uppercase sorts [released as Prestige]. Thanks for posting this Stephen, and to the translators. I appreciate how they explained the language peculiarities instead of trying to recreate them in English. Looks like the Présence Typo hosting fund got diverted to the kayak fund. Hope we see more from him. Hi Stephen, as one of the translator assistant, I’m very proud and very happy that you’ve finally published this article about Thierry Puyfoulhoux. The latter received hereby the recognition he deserves. Thanks you and congratulations to Typographica to make such wonderful things possible. That was an awesome interview. As a young designer, I always wonder how they got started out and how they ended up where they are now. I’ve long been partial to the French esprit in arts and its invigorating effect on Western culture. Thierry’s creations continue the French tradition of strong individual stylization unintimidated by the mainstream. As an Australian whose cultural heritage lies in Western Europe — Je vous saluons Theirry — a true artist. Thank you for publishing my photo of José Mendoza and thank you for posting about French type! I just purchased Adesso by Thierry after reading this article. It’s a fantastic font. I’m Australian too and I think we need more of this kind of down-to-earth design work in our country so I intend to use it in many of my projects. Fascinating interview with a master of the craft, to be sure. I liked his care-free tone yet vast knowledge. Glad to have read this, thank you so much for posting it.